A new study is now enrolling patients ages 8 – 17 to determine the safety and efficacy of Cannabidiol (CDB) for the treatment of hyperphagia and compulsive behaviors in PWS. A live webinar was conducted on January 15th sharing details of the study, what you can expect if you choose to participate, and eligibility criteria for participation. The presentation is about 15 minutes, followed by 15 minutes of Q&A. You can watch the complete presentation by clicking on the embedded video. In case you don't have time to watch the full video, we've included a full transcript below. Details on this study and a list of trial locations can be found on our clinical trial directory. This webinar will be the first in a series of webinars that will bring you more information on active PWS clinical Trials. So let’s jump right into the webinar! Hi, Good afternoon and thank you. My name is Giovanni DeCastro, a Senior Director here at Insys Therapeutics. 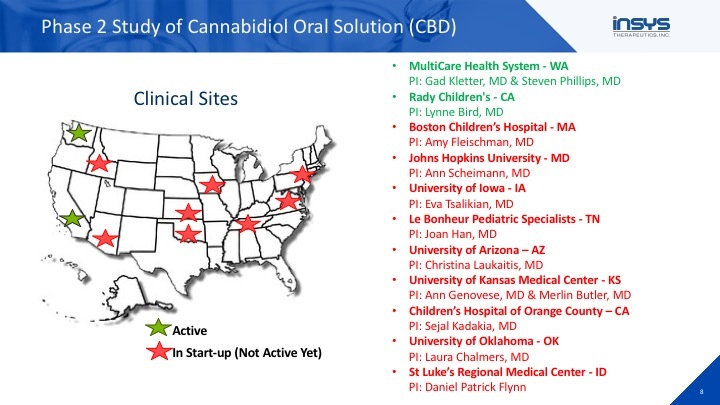 Today's call is the Cannabidiol PWS Webinar and We're going to have Dr. Ahmed Elkashef from Insys Therapeutics as well as Dr. Ann Scheimann from John Hopkins as presenters. Dr. Elkashef is going to briefly go over a quick presentation over the mechanism of action and with CBD. Thank you very much Giovanni and thank you Susan for arranging the webinar. It’s really a pleasure to be with you all, the listeners, and to tell you about our study with Prader-Willi using CBD. A little bit about our company. Insys development company is a small pharmaceutical company located in Chandler, Arizona. We manufacture a synthetic grade, pharmaceutical grade, CBD, in our facility in Texas according to good manufacturing practices. The facility has been approved by the Drug Enforcement Agency and has been inspected by the FDA. The CBD we make is 99.5% pure and can be consistently reproduced without any contaminants or any other cannabinoids, like THC for example. 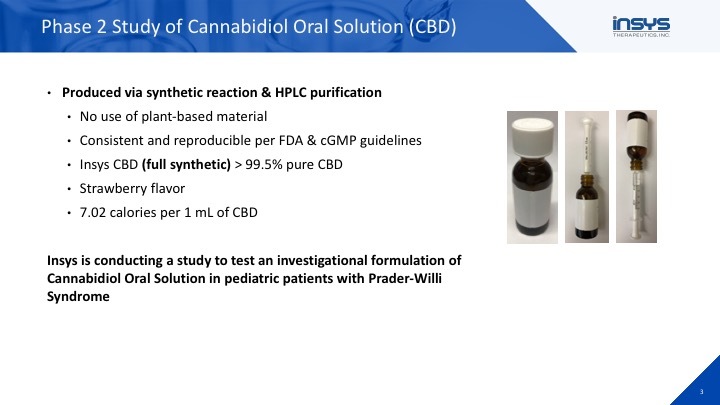 For pediatric use we have an oral solution of CBD that is formulated specifically for pediatric trials. The CBD is mixed with medium chain triglycerides which is a natural fat to help it dissolve and help with absorption and then is sweetened with saccharin. It is not sweetened with sugar. And has a strawberry flavor. 1 ml of CBD is about 7 calories so it's insignificant calorie-wise. We think CBD might help the hyperphagia and weight loss because of observations that we have seen in our other trials with CBD where we noticed weight loss in those trials and also data from nonclinical or animal studies that show the CBD Administration resulted in weight reduction as well as blocking the increased appetite that is induced by THC. Also in the other animal models where food eating was induced by cues of food and pictures of food that normally would increase the appetite and increase the desire to eat, that was also blocked by CBD. 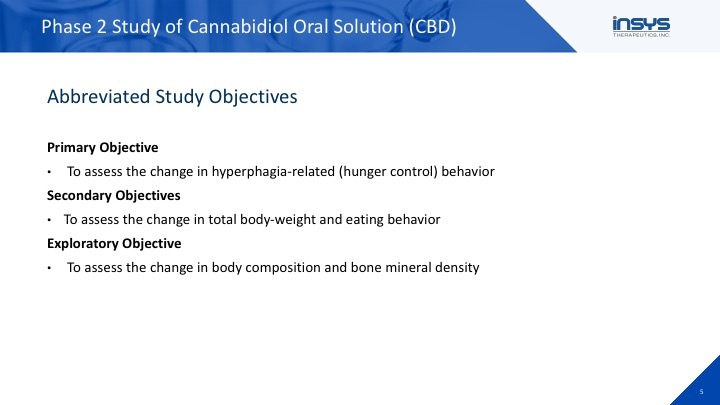 So because of all these factors we are hoping that the trial will be positive and that CBD will lead to reduced appetite and secondarily reduced weight. 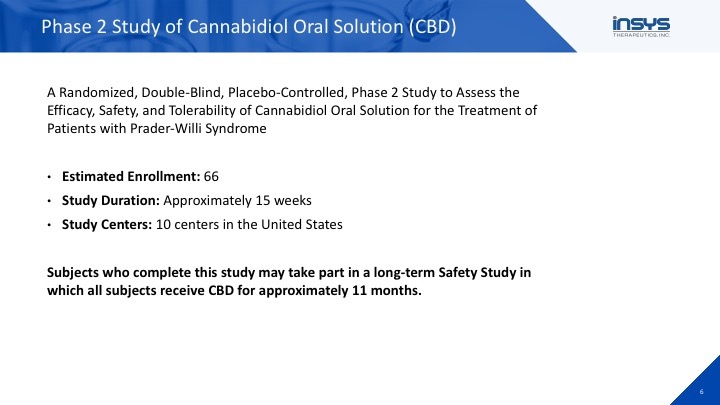 I'm going to go ahead and give the stage to Dr. Scheimann who will be presenting on the details of the randomized double-blind placebo-controlled phase 2 study where we going to look at the efficacy, safety, and tolerability of CBD for the treatment of Prader Willi. Dr Scheimann is an associate professor of pediatrics at Johns Hopkins University Hospital and we are very, very, honored and proud to have her as a senior investigator in the trial. Thank you for inviting me to speak to the Prader-Willi syndrome audience. I'll be reviewing the planned randomized double-blind placebo-controlled study which is listed for treatment of patients with Prader-Willi syndrome. The protocol is INS is 011-6085. The objectives of the study are to primarily compare the effectiveness of an investigational formulation of CBD to a comparable dose of placebo, which will be an inactive substance, to see whether this helps with treatment of hyperphagia related behavior in children with Prader-Willi syndrome. The secondary objectives of the study are several. 1) to assess change in total body weight in children with prader-willi syndrome, 2) to assess the rate of responder response, 3) assess the changes in global impression of change, 4) assess safety and tolerability of CBD, 5) assess the eating behavior in children with prader-willi syndrome, 6) assess the impact of quality of life in children with prader-willi syndrome, and 7) assess the impact on physical activity on children with prader-willi syndrome. And those are all part of the secondary objectives. And then we will have an exploratory objective which is to see whether treatment with CBD has any impact upon body composition and bone mineral density. This is a double-blind, multiple-dose, parallel-group, randomized study. This means that if your child is eligible to participate in the study, your child will be randomly assigned, like flipping a coin heads or tails, to one of two groups. Group 1 is CBD oil solution and group 2 is an oral solution, which is a placebo, it’s a liquid dose of placebo, an inactive substance. Your child will have, going in, a 1:2, or 50% chance, of receiving study drug and a 1:2 chance of receiving placebo. The placebo has no active ingredients but is made to look just like the study drug. Your child and the study team won't know which one they are receiving, similar to what has been done in other prader-willi syndrome studies, just because of the complexity of the disorder. We really want to be sure that we know when there is an impact or not. Approximately 66 patients are expected to be enrolled at 10 places across the U.S. This study does require up to 11 office visits. The overall duration is expected to be about 19 weeks. Which includes 2 weeks for screening, 15 weeks of taking the study drug, and two more weeks of follow up. Children who participate in the study may be asked if they would like to take part in a longer-term safety study in which everybody, whether you were in the placebo group or in the drug group will receive CBD for another 11 months. Again if we look at the enrollment, 66 patients are expected, duration is 15 weeks and there are 10 centers across the U.S. That is the 1st phase and the 2nd phase is a longer-term safety study in which everyone will receive the drug. If we look at inclusion / exclusion criteria, your child may be able to participate in study if they are 1) Male or female between 8 and 17 years of age 2) if they are genetically confirmed as having a diagnosis of Prader-Willi syndrome 3) if they are in generally good health, defined as the absence of any clinically relevant abnormalities as determined by the investigator at the site, and this is based on physical examination, medical history, and then looking at lab values during the screening visit. And then you have to be willing and able to follow the study procedures and visit schedule including blood draws and follow-up visits. There may be other requirements that may need to be met for your child to be able to participate in the study. There are a variety of different study sites as you can see across the U.S.. At the present time there are two sites that are open, which are indicated in green, meaning they’re active. And there is at least one patient enrolled, that is out in the Washington site but Rady Children's is open and there are several sites that will be coming online including Boston Children’s with Amy Fleischman, Johns Hopkins should be up and running within the next couple of weeks, University of Iowa, Le Bonheur in Memphis Tennessee, University of Arizona, Kansas University with Dr. Butler, Children’s Hospital of Orange County, University of Oklahoma, and St. Lukes in Idaho. So a variety of places across the U.S. So if you want more information about how to contact the nearest clinical trial site next to you please visit fpwr.org. Q: Several people have asked why is there a limitation of 17 years old? Why can’t older individuals participate in the study? A: when we look at the design of this protocol we've actually met with several investigators and one of the discussions was the manifestation of hyperphagia is very complex with the typical age of onset between eight years of age. With that said, we have actually expanded the criteria from the ages of 8 to 17 to keep it within the adolescent population. That is the main rationale for this criteria. As we proceed with this program, we will look at expanding this for 18 year of age and older. Q: It looks like there's 10 sites available, but not all families are within driving distance. What type of assistance is available for families who would like to participate but who aren't perhaps within an hour or two of a trial site? Good question! So yes, we have put a travel budget in place which supports patients who are either within an hour or two of driving distance or even further out. My recommendation is that there is a site location that you saw on the slide we presented, reach out to the investigator and ask them if you can schedule a visit. They will do a pre-screening and based on the qualifications, they will arrange the necessary travel. Q: Is there any documentation on this particular drug working in PWS patients? In different age groups and found that CBD was actually beneficial in alleviating some of the anxiety symptoms around in general, or anxiety in association with like anorexia nervosa and other diseases. So we think that the anxiety around craving and the desire to eat, and the fixation on food and the obsession that is sometimes seen in the PW should hopefully be reduced with CBD. Q: How is hyperphagia being measured in this study, particularly in food secure environments? How are you measuring this endpoint? A: So for this study, the investigator will be assessing this through a questionnaire that we have in place. This is a validated questionnaire that has been used in several clinical studies and within that questionnaire they'll be able to answer and asses any food-related problem behaviors. As is explained through each specific question is going to be asked. This is something once the subject is enrolled the study, they sign an informed consent. Once they're consented the patient meets the requirements, and the hypophagia will be measured though that particular questionnaire. Q: Is this study powered to find significant differences and secondary outcomes such as decreased anxiety and OCD behaviors. A: For this study, no, it's not powered. It is powered for our primary endpoint only. We look at secondary endpoints to gather a signal and any other signals that we get then we proceed for those in future studies down the road. Q: We have a patient who is currently 17 but will be 18 in March. Would this patient qualify to participate? A: Yes, as long as the patient is consented when the patient is still 17 years of age. That's the requirement for entry criteria so that subject will be eligible to continue in the study. Q: Not all sites are currently available so would that patient contact one of the open sites or would they need to wait to contact one of the sites that is not yet open and enrolling? A: My recommendation is two points. I would be very aggressive. If I was the patient and the parents, they should reach out to the site that are nearby, just to get in the standing of how far or how close they are for getting up and running.The majority of our sites we are projecting to have up and running in February and the remaining two or three sites by March. The majority of our sites will be ready and eligible to start screening subjects in February. If that site is not eligible then I will continue to to see what's the closest state near them, if that's at all possible. Just keep in mind we're pushing the DEA for approval so we're looking at February for the majority of our sites - 80% of our site to be up and running. Q: So you partially answered our next question which was when will the trial formally start recruitment? It sounds like some sites are open and you can contact them right now, they're going to get you enrolled. What about the other eight? Do you want patients to contact them right away or should we be waiting until they've officially opened? A: I would contact them right away. They can at least start some material, collecting the information on the subject, they can help them you know, depending what stage they are in the project they could be gaining IRB approval or pending the DEA process. They could screen on the phone just to gather some information… So I would reach out to those sites nearby as quickly as you can. Q: Where do we obtain the necessary forms and information for participation? If I recall from the presentation, you want patients to contact their nearest coordinator and those coordinators will provide patients with the necessary forms and information? Q: Many of our children with Prader-Willi syndrome are very well managed their weight is normal, their height is normal, thanks to a controlled environment and growth hormone. Are those individuals going to be eligible to participate in this study if they are not overweight? A: I think one of the biggest things if they still have cravings. If they're still craving and their weight is controlled, I think that's that's something that will be assessed by the PI to see if they meet the criteria. So if those patients are stable but they’re still having acute cravings, the kind that are kind of hard to control, but the food consumption has been reduced from the family end, then they’ll still have that issue to address so this may be a qualifying subject that this will be assessed by the investigator when they actually get a chance to see that subject directly. Q: It sounds like if there is any parent who is in doubt, they should contact the study coordinator and work with the study coordinator to determine eligibility rather than making any assumption? Q: Are there any medications that will prevent participation, for example ADHD medications? A: So we do have a list of medications that are contraindicated in this program. Unfortunately until the subject is able to sign the consent form, that's when the PI will be able to go into the details of the study. But I would say that we made this study very open, very flexible to enroll without limiting factors and understanding that we know our side effects with CBD in regards to other medications and we try to really limit that but our recommendation, again, is to meet with the nearest site, have them go through the process. Once the consent you'll be able to go into the details, not only of the procedures but also the restricted medications. Q: I think some parents may be apprehensive about CBD, specifically because of its relationship to marijuana, will there be information on the specific chemical makeup percentage of the CBD oil before the study begins? So if a patient is interested in participating in the study, will they be given more information about the potential drug they will be taking? CBD oil that's available in the market and we were really really surprised to find that some, may actually have no CBD and some have different rations to what is claimed. But anyway, to get back to the question, yes, they can request information. On clinicaltrials.gov there is information about our CBD there is also information about it on our website. And investigators also will be able to share information that we have in the protocol with the family as well. I should also say that CBD has no alcohol so it's only dissolved in a little bit of natural fat to help absorption and its flavored like strawberry and it's manufactured according to the drug enforcement agency and inspected by the FDA. So it's according to the federal regulations. Q: We're getting a couple more questions coming in regarding synthetic CBD vs natural sources. Are you saying that synthetic CBD undergoes quality analysis so that you ensure that the product that you're giving your child meets certain criteria? A: Yes. We are very confident about our product and that's what we just described. So, you know, we just want to assure families that it does not have any THC. It would actually be very undesirable to have any THC for PW because we know THC increases appetite and that is not what we hope to do with this trial. Our drug is, as Dr. Elkashef stated, is GMP manufactured so we go through the FDA requirements and one of the biggest difference from our product is its synthesized so we have to synthesize our material to meet the requirements specified. Those requirements are not specified within each, you know, investigational product and its not something that is rejected so it is very very regulated from every level and there is significant process that we have to go through. So it's a great question. We wanted to just emphasize those points. Q: And to clarify, this product is only available through this clinical trial. It is not available on the market anywhere else? Q: We have a question regarding travel reimbursement. Does each research site have their own budget for reimbursement? Or does it vary from site to site? A: So we have a overall budget. It comes from from the sponsor, so we just have kind of a bucket of what we are able to support. So all expenses will come through us and we'll be able to, kind of, figure out logistically whether, you know, there is a closer site or not. But yes…. We do have a cap but it's not specific for site. If you want more information on this trial or other PWS trials, you can find a directory of PWS Clinical trials at fpwr.org/pws-clinical-trials as well as on clinicaltrials.gov.